John helps people stop smoking (and stay stopped), lose weight (and keep it off), reduce stress as well as deal with career, relationship and heath challenges. He is a member of the National Guild of Hypnotists and is only one of less than 300 hypnotists Board Certified by that organization (out of a membership of 6,000). John has always been fascinated by consciousness and the idea of personal improvement. He got involved initially in hypnosis to improve creativity and got hooked on using it to help himself and others. Many will know him as the creator of the original Hypnovision Video and Audio series (originally covered by NBC and ABC in the early 1980s). He has had a full time practice in Warwick for more than five years. 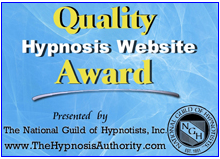 DISCLOSURE: The staff at www.ask-the-hypnotist.com does not verify the credentials of the practitioners listed. If you believe a listed practitioner is misrepresenting his/her credentials, please notify us.